A number of CA alumnae/i are embracing the challenge of farming for reasons that are political and aesthetic, but also intellectual. The scientific precision, Bemis says, is part of the appeal. She is among a burgeoning crop of CA alumnae/i who are embracing the challenge of farming for reasons that are political and aesthetic, but also intellectual. 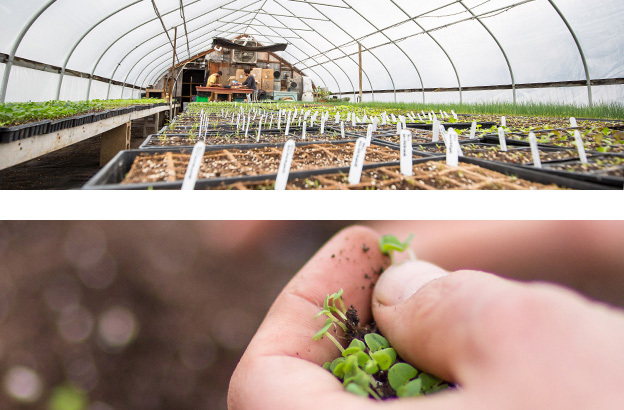 While they love working outside and producing high-quality food, they say much of the excitement of the work is the science: looking for ways to extend the growing season and improve their products; researching new methods to sustain the environment; and working with others to help New England grow more of the food its residents consume. Bemis in the doorway of a greenhouse on Hutchins Farm in Concord, Mass. A graduate of CA and Wellesley College, Bemis did not expect to join the family farm. But after a few years working in offices, the chance to work outside lured her back — and the intellectual challenge of the job has kept her there. It’s a challenge that has inspired many of the young people who work on the farm each summer. Sophie Drew ’15, a sophomore at Haverford College, says her summers doing field work at Hutchins Farm helped shape her academic pursuits and complemented her studies at Concord Academy. She learned about the intricacies of farming as well as how many other areas of life and academic research it affects. Before Hutchins, “I hadn’t thought of farming as a scientific or anthropological area of research,” says Drew, who plans to major in biology and anthropology.For Hannah Hobbs Wolbach ’97, the chance to learn and to experiment is key to her satisfaction as a farmer. She and her husband, Ben Wolbach ’93, grow certified organic vegetables, herbs, and flowers at Skinny Dip Farm in Westport, Mass. 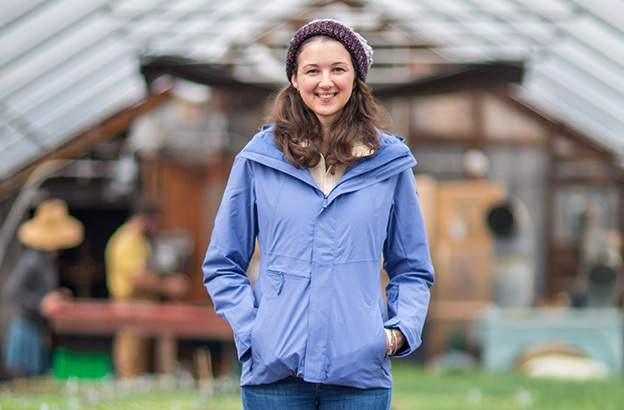 Hannah became interested in farming somewhat unexpectedly, during a semester at the Mountain School in Vershire, Vt. “I went for the backpacking and the skiing and the environmentalism, but I got interested in the farming when I was there,” she says. Scientific challenge takes different forms for different farmers. At Reber Rock Farm in Essex, N.Y., near Lake Champlain, Nathan Henderson ’01, his wife, Racey, and their two business partners use draft horses to power most of the work of their 120-farm. The farm produces meat and a diverse mix of other products, ranging from vegetables and grains to maple syrup and shiitake mushrooms. Henderson, who started his career as a geologist, was compelled by the challenge of land stewardship — how to be lightest on the land while producing as much as you can. It’s why Reber Rock Farm relies heavily on draft horse power, with some diesel power as well. “We produce beef and make all the hay that our animals eat using primarily the draft horses, so the carbon footprint of one of our beef products is very, very small,” says Henderson. Some alumnae/i have found outlets for their scientific interest in farming without necessarily living on a working farm. Johanna Rosen ’97 recently bought a parcel of land in Montague, Mass., where she hopes to start a small farm, but her primary professional life involves food policy. As part of a team at Food Solutions New England, Rosen hopes to increase the amount of food produced in New England from 10 percent of what is consumed in the region to 50 percent by 2060. It’s an ambitious goal, given how little land in the region is undeveloped — and how expensive most of it is. “It’s really important to protect the farmland we have and think about how to make it affordable for farmers to get onto that land,” says Rosen. She says that unfortunately, “local food” has become something of an elite term. Her team, which is supported by the University of New Hampshire, is looking to make locally produced food both more widespread and more accessible while still paying farmers a fair share for their work. As CEO of FreshBox Farms in Millis, Mass., Sonia Lo ’84 is also interested in local food and using new technologies to create it. FreshBox has pioneered the use of high-density, high-yield, pesticide- and GMO-free vertical hydroponic farming in indoor enclosures. Hydroponics is a method of agriculture that uses nutrients in water, rather than soil, to grow plants. Lo’s company plants heirloom seeds to support biodiversity, regulates nutrients by parts per million, and refines LED lighting to match the exact spectrum of light plants need to thrive. That means she can grow more greens using less water — roughly 2,000 times less water than conventional agriculture — and faster, too. FreshBox can grow a head of lettuce in about five days; in a field, most heads need two to three months to develop fully. And because the plants grow indoors (and up, rather than out), she can produce fresh greens during the winter on a smaller footprint, an ideal way to expand access to local produce for urban and suburban communities. 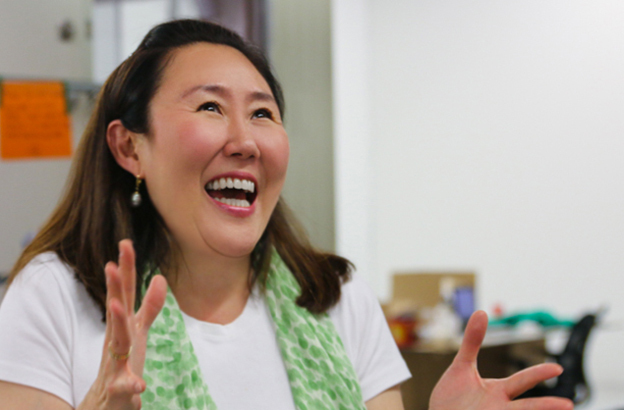 At Fresh Box Farms, where Sonia Lo ‘84 is CEO, CA students got a taste of hydroponic farming. Lo describes herself, in a low-key way, as a “box farmer,” but her work offers a blend of scientific innovation and entrepreneurial skill that proved inspiring to Miranda Brown ’17, a CA senior who interned with Lo last summer. As an intern, Brown measured and worked on harvesting greens, and she was fascinated by the growing model. 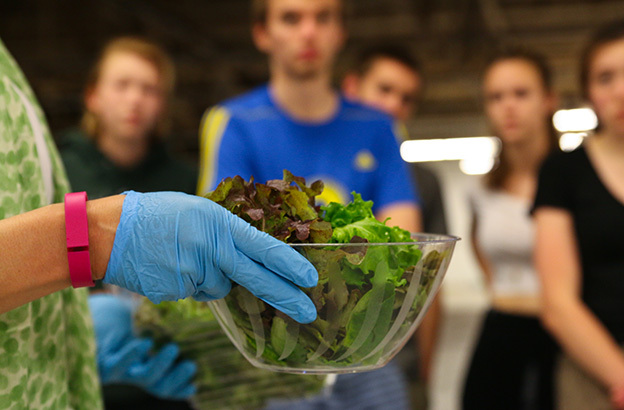 She started wondering whether Concord Academy, with its bountiful salad bar, could grow its own produce hydroponically. 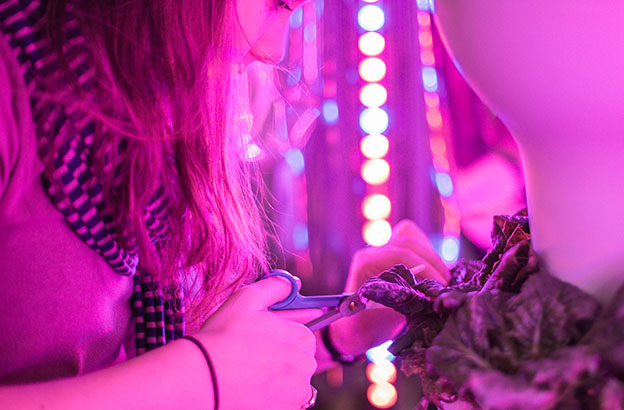 She, CA science teacher John Pickle, and other students researched and created a light tower, then bought a growing light from a hydroponics company. She planted seeds and then, every two weeks, she would harvest lettuce and Swiss chard. Early in the spring semester, the whole CA community enjoyed the fruits — or, rather, vegetables — of Brown’s labor. A bowl of hydroponically grown lettuce stood at one end of the salad bar. Students and faculty sampled the greens and read about Brown’s project, which was part of an independent study. 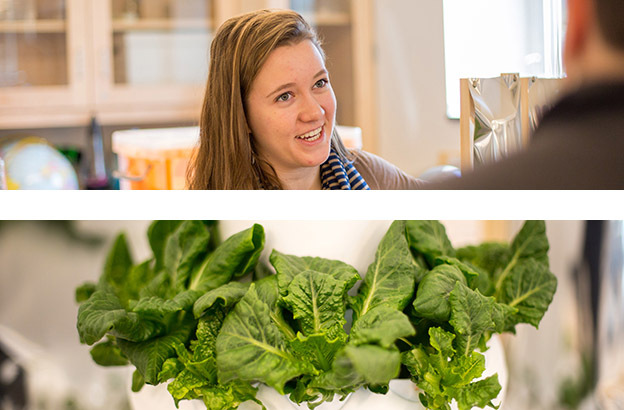 Senior Miranda Brown grew hydroponic lettuce and Swiss chard in John Pickle’s classroom in CA Labs for a departmental study. Early in the spring semester, the whole CA community enjoyed the fruits — or, rather, vegetables — of Brown’s labor. Senior Miranda Brown grew hydroponic lettuce and Swiss chard in science teacher John Pickle’s classroom in CA Labs for a departmental study. Early in the spring semester, the whole CA community enjoyed the fruits — or, rather, vegetables — of Brown’s labor. Brown says she enjoyed the scientific aspect of the project, but overall, her greatest satisfaction came from the sense of having grown food for her own community. “Wow, I’m actually growing food for the Stu-Fac!” she says with a laugh. A day student from Needham, Mass., Brown hopes to study urban agriculture at Barnard College in the fall.